Spoiler alert —–> Yes, it turns out that I am an optimist. Honest. Really. Maybe you are, too? My father was an optimist and I acquired that attribute from him. 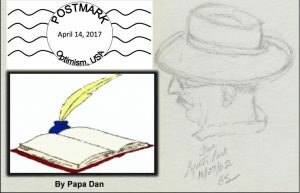 In fact, believe it or not, when he was an insurance agent back in the 1950s, he was actually the president of a club of other businessmen in town, called “The Optimists Club.” They had an “Optimist’s Creed,” which they recited at meetings. (Yes, they actually had meetings.) He was an optimist in earnest. As a successful businessman who had not completed the eighth grade and was the son of an illiterate immigrant, it was actually part of his experience to expect positive surprises. A friend of his, Jerry Bassett, also a member of the Optimist Club, had a call-in talk show on the local radio station (KKIS in Pittsburg, CA). On those Saturday mornings, the show was playing on the radio in the office. One day, Jerry wasn’t getting enough callers; so, he called my Dad during a commercial and told him “I’m dying here, Al. Can you call me up with something interesting to talk about? 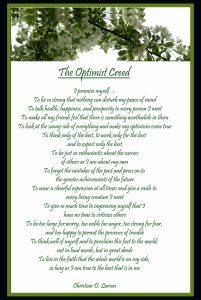 Whuhduhyuhsay?” So, my Dad took the framed “Optimist Creed” off the wall and called him back. I was stunned. There was my Dad, sitting at his desk, telling Jerry Bassett about the Optimist Club and why it meant so much to him. He actually read the Optimist Creed over the phone and I sat there and listened to my Dad on the radio — with the confusing five-second delay — talking about what it meant to him to be an optimist. Apparently, others called in and wanted to talk about it; so, I guess it sorta saved the show for Mr. Bassett. For me, a ten-year-old sitting in my Dad’s office on a few Saturday mornings, while I didn’t acquire an interest in the insurance business, I did develop an appreciation for the idea of being an optimist — just by watching, listening, and observing how people responded to him. I learned over time from my Dad and from my own observation, that being an optimist meant a number of different things to him and to others. As I read the news and listen to what people say about it all, I grant you that it requires some effort to be optimistic these days (I’m sure I don’t have to tell you that); but it seems that many of us have different views of what that might mean. So, let’s explore some of the different meanings people attribute to optimism — borrowing some words from a few others — and then, let’s try to figure out what it might mean to us to be an optimist today. Let’s ask around. It seems there are different kinds of optimists. This is the classic belief that, at some time in the future, something better will happen if you just wait for it. We fall and we make our mistakes. Not all of us are going to run for office, speak to an audience of millions, and change the world. For many of us it may have to be enough to serve as a good example to encourage others — our children, their children, people we meet — to BE the change that is required. Maybe all it takes is a few words of encouragement to younger minds — maybe words like “Yes, we can.” It turns out that some outcomes are possible even if we haven’t seen them before. It turns out that some outcomes are possible even if we haven’t seen them before. Some look at the mixed advice we hear and get discouraged by disappointing outcomes — but some don’t. One thing seems essential — that we do not settle into the extremes of “always” and “never” — that we find an optimism based on the idea that, sometimes, good outcomes are possible. Sometimes. This poem by Sheenagh Pugh reminds me that, whichever variety of optimist I decide to be, on a particular day, there is reason to believe in positive outcomes. They don’t happen by themselves, they do require our efforts, but they happen … sometimes. enough that they can’t leave some stranger poor. So, what have I learned from all of these voices? My Dad taught me about “sometimes” as his Dad taught him. The other side of “sometimes” is that sometimes we need to stomp around and be “The Determined Optimist,” and march in the street with other determined optimists. Sometimes the best we can be is “The Resigned Optimist” and simply try not to give up. Sometimes we are forced to be “The Patient Optimist and “Wait for It.” Sometimes we can see a middle path and serve as a “Confident Optimist” and contribute to incremental change by contributing to organizations that can accomplish important changes with lots of small donations (examples: organizations like the ACLU, Planned Parenthood, PBS, The Yosemite Conservancy, Meals On Wheels, your local library … you probably have your own list.) Those among us with more imagination and determination may find ways to “Be the change we seek.” Perhaps our task, if we can’t BE one of them, is to support those who do. Thursday, April 13th, 2017, by Daniel and is filed under "Ideas, Politics, Who We Are ". You can leave a response here, or send a Trackback from your own site. Oh Dan, your post is tonic for our troubled times! I will share it, and thank you for this gathering of voices. Dorty, Since posting this one, Lauren reminded me of another “Optimist” story: A child walks out in the yard on her birthday and finds herself face-to-face with a large pile of horse manure. To her fathers surprise, she is delighted. She says, “With all of this horseshit, there must be a pony in there somewhere!” Thanks for reading (and for your optimism — you DO have some, right? ).